Accessibility - You may have heard the term but not known exactly what it means or how it relates to you. Accessibility refers to how products, devices, services and environments are designed to ensure it can be used or accessed by people who experience various forms of disabilities. Some common examples you may encounter in your everyday life is seeing ramps to enter and exit buildings, braille on the ATM buttons or seats at the front of a bus that have room for wheelchairs. When it comes to technology, there are many features and functions as well as complementary equipment that can make technology more accessible for the broader community. With nearly 20% of the Australian population having some form of limiting physical, learning or mental ability, access to digital devices can have its challenges. 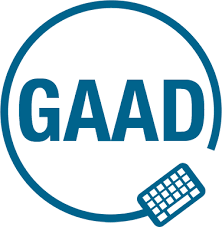 Thursday 17 May 2018 was Global Accessibility Awareness Day (GAAD). The Australian Network on Disability put together a great list of resources related to accessibility that we found interesting. YourLink believes that all people should have a quality of life that includes happiness, sense of purpose and a feeling of being valued. Part of our goal is to build an inclusive community for our ageing loved ones. Our recent article about tips and tricks with the iPad showed some accessibility features that can help individuals and we look forward to sharing more in the coming months. Members of the YourLink team are now accredited as accessibility experts as part of the Apple Consultants Network. We are proud to be one of the few organisations who are part of the network that are focussed on the Aged Care and Community Sector. This is an exciting addition to the services and value we provide our clients. We know this will help to create real benefits to real individuals in a way that really matters. Some practical ways we use our accessibility skills to make a difference. Partner with the aged care and community sector to create a greater change across the sector. Accessibility is continuously improving and we are always looking for how we can stay up to date with this. With the latest wave of smart home assistants like Apple HomePod, Google Home and Amazon Echo as well as voice assistants like Siri (Apple), Google Assistant and Alexa (Amazon) the potential for further ways to embed accessibility in technology becomes even greater. Apple takes great pride in its’ strong accessibility pedigree. You can view more about this on the Apple website. And watch this video below to see accessibility in action. If you are an aged care provider or community organisation, contact us to talk about how we can tailor our unique services to support your team and clients.